It is estimated that around 2450 Ml/d, almost 50% of the groundwater used for public supply, is affected by quality problems. 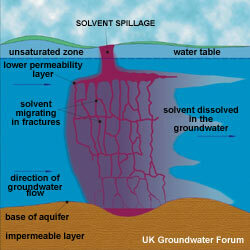 The quality of groundwater in UK aquifers has deteriorated significantly over the last few decades. While little or no treatment was required in the past, water utilities have increasingly had to install treatment at their groundwater sources. This has incurred high capital and operating costs, most of which have been passed on to the consumer through water charges. In many cases, groundwater sources have become polluted to the point where they are uneconomic to treat and have had to be abandoned. Recent research for UK Water Industry Research Limited (UKWIR) and the Environment Agency, undertaken by the British Geological Survey (UKWIR Report 04/WR/09/8), looked at the implications of changing groundwater quality on the water supply industry. The national study showed that groundwater quality problems in the UK have cost the water industry about £754 million since 1975. Of this, £436 million has been spent on treatment schemes, £134 million on blending and £184 million on replacement water to compensate for source closures. This reflects a combination of deterioration in groundwater quality and more stringent regulatory standards for drinking water. The greatest expenditure has been caused by the presence of nitrate, pesticides, Cryptosporidium, arsenic and hydrocarbons/solvents (some of these are addressed in the Drinking Water Inspectorate web pages on current issues). Groundwater is a vital source of water for public supply, agriculture and industry in the UK. It accounts for about 27% of the total public water supply nationally, although the extent of groundwater dependence is substantially higher in certain regions, notably south-eastern England. In the past a major attraction of using groundwater was that it usually required little or no treatment, but this is no longer the case. High nitrate concentrations, primarily as a result of increased agricultural production since the 1940s, affect many groundwater supplies. The same is true for pesticides , widely used for weed control in agriculture, on roads and railways, and to control pests in agriculture and industry. Groundwater quality problems have also arisen from accidental spills or leaks from tanks and pipelines of petroleum products, phenols and chlorinated hydrocarbons. Contaminated land and urban pollution have given rise to a range of liquid and gaseous pollutants. The more soluble and mobile of these pollutants can infiltrate to the water table resulting in plumes of slowly moving contaminated groundwater from many industrial sites. Information about sources, volumes of water affected and costs incurred were collected from the water utilities for five year periods since 1975, to coincide with the Asset Management Plans timetable in England and Wales. The data and trends were analysed so that some attempts at scenario modelling might be carried out, and to establish the current position. Extrapolation suggests significant future capital investment costs in the UK. These could be at least £73 million and possibly as much as £180 million (at 2003 prices) for each 5-year period, with increasing operating costs as the total volume of water treated rises. This assumes that water demand, the current quality drivers and the regulatory setting do not change. It also discounts any effects of climate change. By 2027, the volume of water that might have to be treated or replaced may have doubled from the current level. This would mean that almost all groundwater would need to be treated, emphasising that the current situation is not sustainable. These estimates are conservative because they do not take account of industry responses to further regulatory changes. Neither do they take into account the consequences of implementation of the Water Framework Directive, which may dictate that quality standards apply to groundwater prior to treatment. If this happens it is estimated that an alternative source for some 1800 Ml/d of water (35% of the total groundwater supplied) would have to be found by 2027. Groundwater in most areas of the major UK aquifers is already fully exploited so other sources of water would need to be found. These could include surface water impoundment, effluent reuse or desalination, all of which would have serious financial and regulatory implications. Capital costs of the order of £2 billion seem likely. It would appear that the time is ripe, if not overdue, for more consideration of the problem of degrading groundwater quality, with a view to developing remediation and mitigation strategies. The measures necessary will result in costs not only for the water industry, but also for other stakeholders such as those in the industrial and agricultural sectors. These and other stakeholders - the environment regulators, planners and policy makers – must all be involved in the decision-making process. To take an example, the most acute groundwater quality problem seems to be that of continued and increasing nitrate pollution. This is well demonstrated by the occurrence of upward trends in nitrate concentrations for many public water supply boreholes. Measures to address this problem in the long term have and will continue to require changes to land use that, in particular, may affect the sustainability of the agricultural sector. These measures, however, may not provide a solution in the short term. The response times of the UK’s major aquifers can be long and reversing trends may therefore be problematic. For instance, a change in land use on the Chalk aquifer aimed at reducing the leaching of nitrate from the soil may take decades to have an effect on the quality of base-flow feeding rivers or water pumped from boreholes. Therefore, in the short term, as discussed above, alternative solutions may have to be sought, the costs of which could fall on the water industry.